Move over Hasselback Potatoes! This Hasselback Chicken Stuffed with Bacon, Ranch and Cheddar is moist and tender and cheesy and bacony and is easy to make! The slits in the chicken breast are stuffed with bacon and cheddar cheese and ranch flavored cream cheese. This chicken recipe will quickly become a family favorite meal. Bacon, Ranch, and Cheddar! Yum! 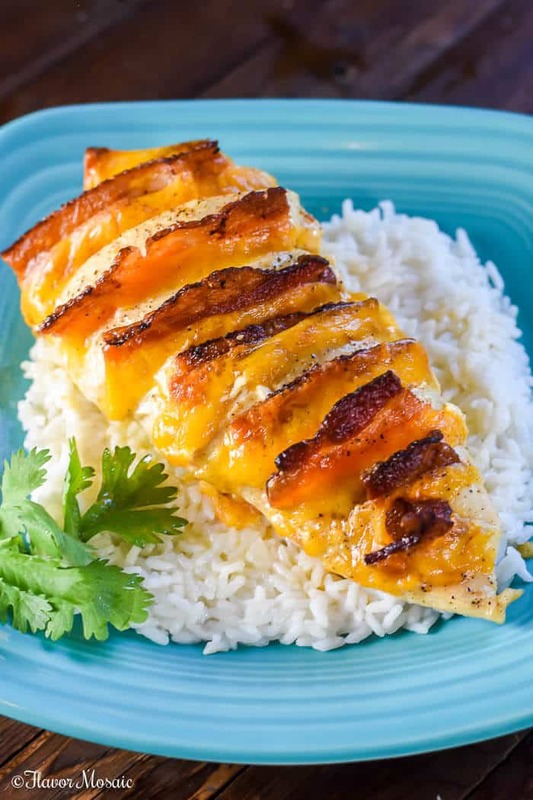 This Hasselback Chicken Stuffed with Bacon, Ranch and Cheddar will totally rock your world! You will love it! What’s not to love? 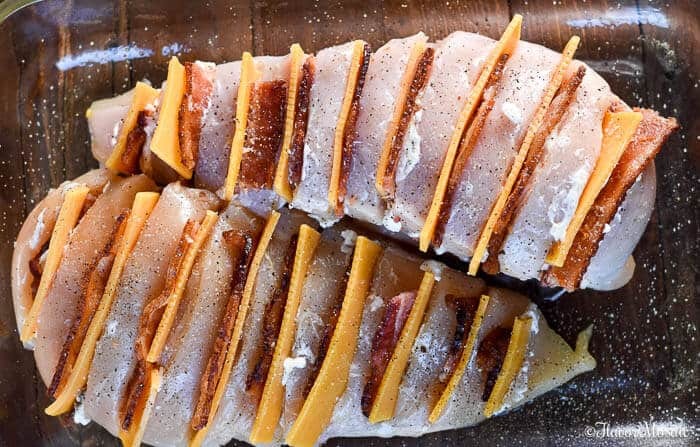 It has bacon, ranch seasoning mixed with cream cheese, and cheddar cheese stuffed inside slits in the chicken breast so you get an explosion of flavor in every bite! Super Yum!! This ain’t no boring chicken dinner! I’ll tell you that. This Hasselback Chicken recipe was styled after the popular Hasselback Potato, with the horizontal slices (or slits) across the potato, which was first created way back in the 1700’s in Stockholm Sweden at a restaurant called Hasselbacken. They would make thin slices (or slits) across the potato and stuff each with bacon and cheese in between each slice. What a great idea! I bet if they had ranch seasoning mix back then, they would have added it too. There you go. I bet you didn’t expect a history lesson with this recipe, did you? Why should this technique be limited only to potatoes? Why not use the same technique to dress up chicken, and impress your family and guests with this Hasselback Chicken? What Are The Ingredients For Hasselback Chicken? How Do You Make Hasselback Chicken? Below is the step by step instructions with photos. Also, see the How To Make Hasselback Chicken Video as well. Also, see the printable recipe at the bottom of the post with all the specifics. This Hasselback Chicken Stuffed with Bacon, Ranch, and Cheddar is easy to make. You start by making slits in the chicken breast about a half-inch apart. Then mix the ranch seasoning mix with softened cream cheese and spread that inside each slit in the chicken breast. This provides loads of flavor and moisture. Season the chicken breasts with salt, pepper, garlic powder, paprika, and if you want to add a little smoky spice, add a little chipotle chile powder. 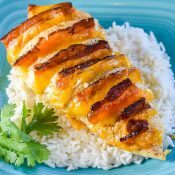 Place this Hasselback Chicken Stuffed with Bacon, Ranch, and Cheddar in a preheated oven and bake until the chicken is cooked through and no longer pink and the cheese is melted and bacon cook. 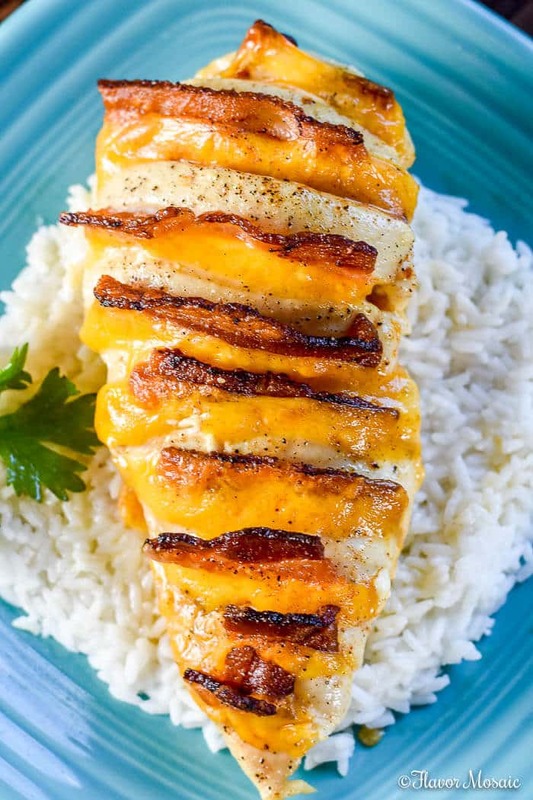 Every single bite of this Hasselback Chicken Stuffed with Bacon, Ranch, and Cheddar is deliciously moist, tender and flavorful. By adding the slits in the chicken breast, it adds incredible flavor to every bite. Even though it looks like it might take a long time to make, don’t let the gourmet appearance fool you. This recipe really does come together quickly. Really, how long does it take to cut slits in a chicken breast? 5-seconds? Chicken, bacon, Ranch seasoning and cheese go together so well. The flavor combination is out of this world. 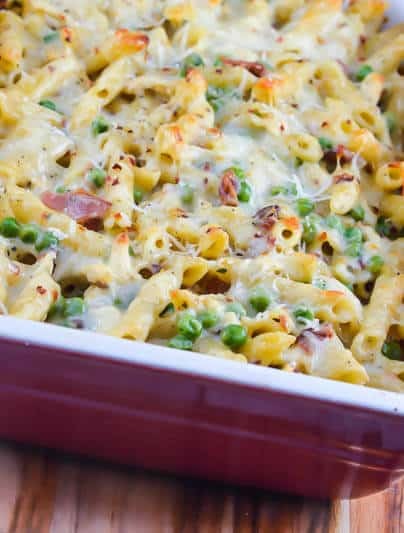 If you like this recipe be sure to check out my Cheesy Chicken Bacon Ranch Pasta recipe. It is one of the most popular ones on the blog! Move over Hasselback Potatoes! 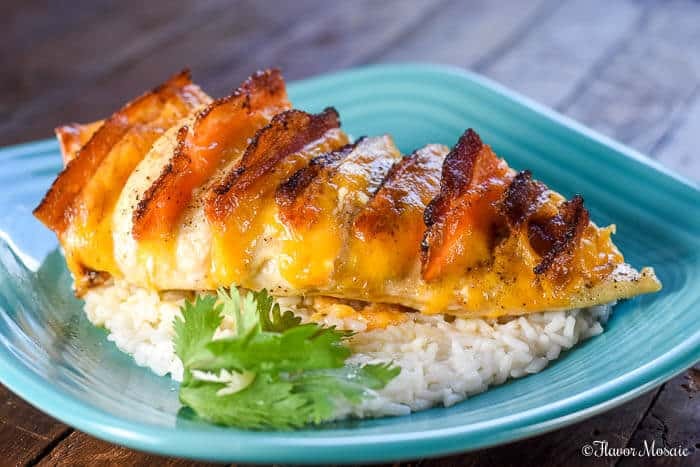 This Hasselback Chicken Stuffed with Bacon, Ranch and Cheddar is moist and tender and cheesy and bacony and is easy to make! Preheat the oven to 350 degrees F. Line a pan with foil. Cook the bacon until it is just over about halfway cooked. Remove from oven and set aside. 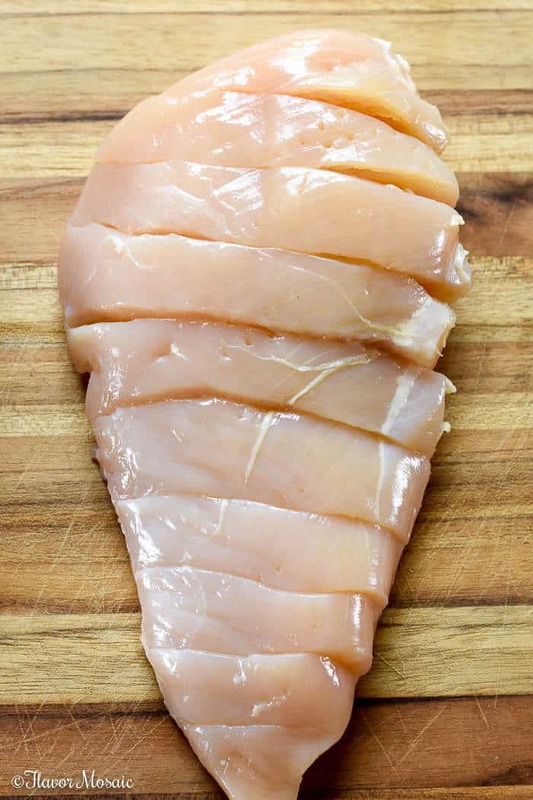 Make slices or slits across (horizontally) each of the chicken breasts. Make each slice about 1/2 inch apart. See photo for reference. In a small bowl, stir together the Ranch seasoning mix with the cream cheese. Using a knife, spread a small amount of Ranch seasoned cream cheese inside each slit. 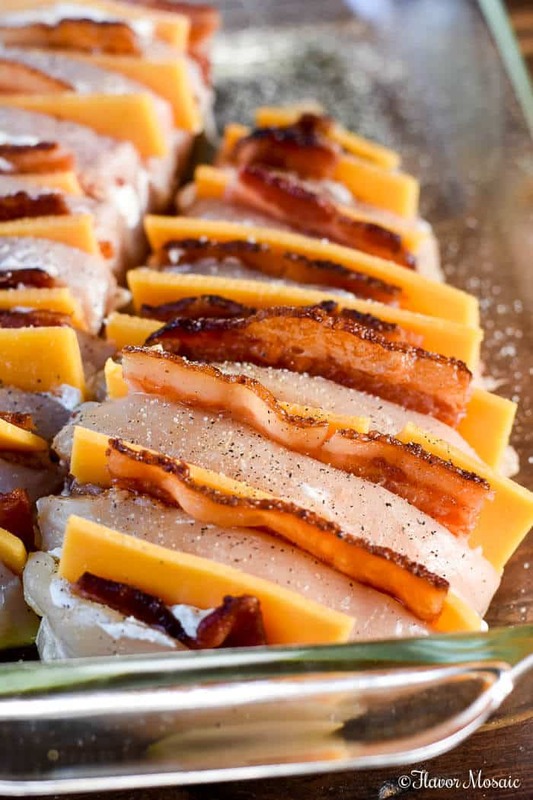 Cut the bacon slices and cheese slices to sizes that will fit into the cuts of the chicken. Place a slice each of cooked bacon and cheddar cheese into each cut. Be sure to Pin this so you can save it for later. 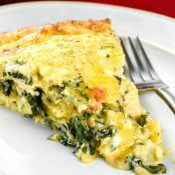 If you like this recipe, be sure to check out these other recipes!